A bowling alley is one of 55 proposals put forward by non-profit groups for the Woodward’s facelift. Vancouver city council is to vote Tuesday on the method it will use to choose which groups become tenants in the revamped Woodward’s building on Hastings Street. The list of applicants include the Dragon Boat Festival, the Vancouver Folk Music Festival and the Kootenay School of Writing. Vision Vancouver mayoral hopeful Jim Green said the remake is a city-wide project, which will employ and cater to locals. NPA mayoral candidate Sam Sullivan wants 10,000 square feet, or one-third of the space allotted to non-profit groups, to be converted into market rentals. Sullivan said it would help recoup some of the $30-million-plus cost overruns already on the project. As part of its deal with the developers, the city will get 31,500 sq. ft. of space to lease to non-profit tenants for $1 per year. Tenants will have to pay the overheads of $6 or $7 per square foot. Preferred non-profit uses include a seniors’ centre, arts and rehearsal space, as well as offices for non-profit societies. The Portland Hotel Society has applied to run an “affordable grocery store” and a 37-space childcare centre. PHS has been chosen as the operator of 125 social-housing units for singles, with the other 75 units for families. All tenants will be chosen by a selection panel. Woodward’s project manager Michael Flanigan said many non-profit agencies in the Downtown Eastside already have established offices there. What’s hot for the home? Trouble-free, maintenance-free roofing that has the high-end look of slate or hand-split cedar shakes. EuroSlate is available in seven colours, and EuroShake in four colours. The tiles are manufactured by G.E.M. Inc. right here in Calgary. Homeowners — including homeowners looking for an attractive replacement for their rotting shakes — along with a growing number of developers and builders. Word of mouth has been EuroSlate and EuroShake’s best advertising, says Sean Zimmer, vice-president of marketing at G.E.M. Inc. One new roof recently spurred 10 more orders from admiring neighbours. Most roofs are suitable candidates. “You can’t use our product on a roof with a pitch lower than 2/12 — which is getting pretty close to a flat roof,” says Zimmer. 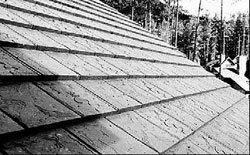 A EuroShake roof will cost about the same as a good quality cedar shake roof. Depending on colour, EuroSlate will be somewhere between the cost of cedar shakes and a concrete tile roof. If you haven’t priced these things lately, that’s usually $5.50 to $6.50 per square foot on a re-roof application. 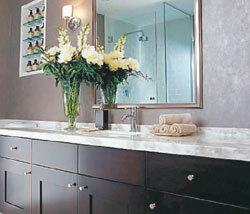 Order through G.E.M.’s showroom, or from the trained, certified applicators listed on www.euroslate.ca. And it’s okay to call G.E.M. for a list of nearby homes you can drive past to see how the product looks when installed. The tiles are completely maintenance-free, but it’s always good idea to keep an eye on your rooftop. Standard roof fixtures and fittings, such as the “boot” around the plumbing stack, won’t last nearly as long as your roof. “Our material? There’s nothing you need to do to it,” says Zimmer. So durable there’s a 50-year warranty on it. “Our product has been tested and certified by the CCMC (Canadian Construction Materials Centre). We’re the most tested roofing material in probably North America today,” Zimmer says. In fact, rounds of extreme testing revealed almost no weathering at all. The design of the tiles is a big advantage. The two-by-three foot sheets are honeycombed underneath, and every sheet overlaps and interlocks with adjoining sheets. “Everywhere on the roof you’ve got two layers of rubber and two layers of air cells. Rubber and air are two of the best insulators in the world,” says Zimmer. “It deadens a lot of the noise outside your home — like planes flying over” but more importantly it helps keep your home cooler in summer and warmer in winter. If your home has cathedral ceilings, the extra insulation is a real bonus. “You can walk on it.” With other types of roofing, warranties can be voided by getting up on the roof. Hail bounces off, so some insurance companies will give a discount for a rubber roof, Zimmer says. And last but not least, for a middle-of-the-road price you get that fabulous high-end look. Delivery times are now eight to 10 weeks for new orders — a surge of demand has temporarily outpaced production capacity. However, over the winter months the warehouse will gradually fill again, so homeowners would be smart to order now for spring installation. The product will smell like new tires for a few days after it’s installed, but the odour quickly fades away. The Kerdi drain cutaway for a shower drain designed to keep a shower in tip-top condition. Every time I step into a ceramic tile shower and turn on the water, I’m jealous. How can any other shower experience compare with the solidity of the tiles underfoot, the sharp sound of water splashing against hard surfaces and the inviting warmth that builds in the walls and floor after squandering gallons of hot water on yourself? I’ve tried to convince myself that the practicality of a fibreglass shower stall makes so much more sense. But somehow, that doesn’t cut it. The only consolation I had up until now is that ceramic tile shower stalls are often risky and troublesome to build for all but the most experienced tradespeople. That’s why I opted for a serviceable, fibreglass unit when I outfitted the bathroom in my own house more than 10 years ago. But now, even that solace is lost to me. Thanks to advances in shower installation, the old threat of leaky, crumbling ceramic shower stalls is a thing of the past. Diligent do-it-yourselfers can complete a first-rate job building a reliable ceramic tile shower, while professionals will enjoy speedier installation times. The key has to do with what goes underneath your tiles. Traditionally, the main challenge with ceramic tile shower stalls has always centred on the difficulties of waterproofing. While it’s easy to find waterproof tiles, the grout between them are a different matter. Even when coated with sealer, you can’t expect three or four millimetres of porous, site-mixed grout to keep water out forever. And unless the tiles and grout are installed over a waterproof, sub-surface membrane, water leakage will eventually cause loose tiles and rotten wood. Then there’s always the perennial threat of water leakage around drain outlets. 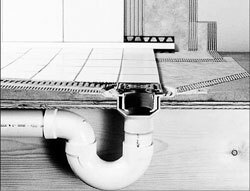 This is the kind of trouble master tile setter Werner Schluter sought to solve when he began to market hardware and accessories designed to improve traditional ceramic tile installations. The Schluter Shower System is a case in point, and it uses specialized, synthetic materials to create a waterproof pan and wall system that readily accepts ceramic tiles. And it even includes a substantial made-in-Canada component. This isn’t the only foundation for a durable shower, but it’s one of the most foolproof. The base of the Shower System, or pan as it’s called in the trade, is made of high-density expanded polystyrene foam and comes in two parts that dovetail together on the floor as they nestle into a coat of thin-set mortar. This is the part of the system that’s made in Canada for international sales. The pan includes a pre-punched, central hole to accommodate the drain flange system that comes with the kit. A third piece of foam forms the 15-centimetre-high curb that keeps water within the pan during use. The Shower System also includes enough synthetic, non-woven fabric material, Kerdi, to cover the inside of the shower stall framework and make it waterproof. Perhaps the best part of the Schluter kit is the detailed instructional video that comes on CD-ROM. It’s readable on both Mac and PC computers and provides a field-worthy overview of the installation process. Never installed tiles before, but want to try? There are two excellent resources. The first is a book, Setting Tile, by Michael Byrne. It’s a classic, covering all the traditional tile setting techniques, including detailed information on cutting and securing ceramics. A more recent information product is a pair of videos (also available on DVD) put out by Hank (The Tile Doctor) Visser. One is on floor installations, and the other covers showers. It’s the video equivalent of following a kind, knowledgeable and patient 40-year veteran of the tile setting trade while he completes several jobs. You can learn more about the videos at www.hankthetiledoctor.com, or order by fax at 1-231-275-3116. He even extends a standing offer to answer technical questions by e-mail. Although the videos do come from the United States, they crossed the border easily for me. CREDIT: Photo by Ian Lindsay, Vancouver Sun The layout optimizes narrow view corridors, with windows that open onto the kayak dock. Furnishings from Inform Interiors. CREDIT: Photo by Ian Lindsay, Vancouver Sun Indoor-outdoor living: Sea Village’s modernist gem fits the Granville Island palette of cedar, metal and glass. CREDIT: Photo by Ian Lindsay, Vancouver Sun The third-floor family room neatly accommodates collectibles and clutter, the industrial sliders opening 10 feet onto the rooftop deck. CREDIT: Photo by Ian Lindsay, Vancouver Sun Robert Lange of DGBK Architects worked with IMFS Floatation Systems, from the Styrofoam up. CREDIT: Photo by Ian Lindsay, Vancouver Sun The front hall’s custom maple cabinetry tucks smartly into nooks and under stairs to create maximum living space. 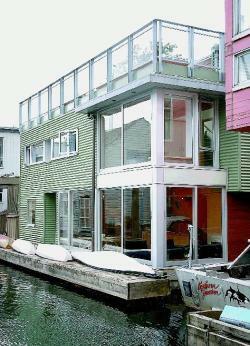 Choosing to live in a floating home is tantamount to saying, don’t fence me in. Nowhere is this feeling more palpable than smack in the middle of Vancouver‘s aquatic cul-de-sac, Sea Village. Bordered by the city’s busiest waterway on one side and its most hectic seawall on the other, with Granville Bridge traffic buzzing overhead and Concord Pacific’s construction crews reshaping the shoreline opposite, this tiny neighbourhood offers the surprising sense of being worlds away. The visitor need only walk down the ramp off the Granville Island seawall to experience an immediate washing away of urban stresses — work, school, traffic, all swept under the dock. Which is not to say it’s for everyone. Only 30 people live here, in 13 floating homes, about half of them survivors of the community’s eviction from Coal Harbour 26 years ago, when houseboats were turfed to make way for waterfront development. The size and shape of Sea Village are strictly controlled by Canada Mortgage and Housing Corporation, Granville Island‘s landlord, and by the City of Vancouver, which handles permits and development for the federal agency. If you think it’s hard to build the house of your dreams on land, try doing so on False Creek. It can take years to navigate the bylaws, after which you face all the challenges of flotation, not to mention the constant tidal change, the dock-rocking wake of passing party boats and the seriously tipsy effect of having too many heavy relatives sitting on one side of your dining table. Sea Villagers must also deal with the gawkers. Hundreds of them a day in the high season, tourists and locals, all drawn to this charming corner of False Creek, like gulls to a trawler. I happened to be there to meet with Robert Lange, an associate of Vancouver‘s DGBK Architects, who designed the “modern one” for a family of four who had recently moved here from Dunbar. Which is to say, they followed their house in their car as it was towed from its construction site in Ladner around Point Grey and into the creek. But they’d rather let Lange answer the serious ones, such as how do you maximize living space atop a slab of concrete-coated foam without creating a big, boring shoebox? And how do you protect privacy on the very public south-facing walls without darkening the living spaces? And how do you capture the spectacular water and mountain views to the north when you’re berthed in the village’s back row? For meeting all these challenges, and more, Lange is being honoured next month as a recipient of Western Living magazine’s 2005 Residential Design Awards. “The award recognizes the social and environmental creativity of Lange’s design,” says the magazine’s editor Jim Sutherland, who is featuring the home along with three other winners in his October issue. For one, he had to use every space-saving trick in the book to make the 1,750-square-foot structure comfortable for a growing family moving from a traditionally furnished 2,700-square-foot home. Working closely with his design-savvy clients and with interior designer Kathryn Lange, he created large, airy living spaces whose fluid lines and reflective surfaces provide seamless integration between indoor and outdoor, land and water. What you see from the dock is intentionally less interesting than what a passing boater would see from the water. There is minimal glazing on the public south side, the only clear window being a narrow sidelight at the front entrance, offering a mere hint of the jewel-box interior. The imposing south facade is clad in cedar and corrugated metal — fitting references to West Coast modern and Granville Island industrial esthetics. A broad skylight brings natural light into the entire front of the house on all three levels, thanks to an open staircase with nautical-style steel cable and channel stringers supporting light maple treads. Recessed and track lighting plays off the reflective surfaces throughout the interior — steel, glossy maple and limestone. It’s an ideal backdrop for sleek, modernist furnishings, including the classic Mies van der Rohe leather set in the living room, a Niels Bendtsen dining table and Hans Wegner chairs. On the creek side, soft northern light pours through six-foot-high windows. The sense of living on the water is so palpable that the owner was moved to leap out his bedroom window into the creek to celebrate the house’s arrival on a hot day last summer. A finger dock has now been attached below to accommodate the family’s five kayaks, so jumping is out, but the swimming is fine — thanks to the city’s recent clean-up work around False Creek. The docks are buzzing over the summer, quieter this time of year when the action moves up onto the decks where neighbours gather in friendly groups, stoking barbecues, tending potted plants, taking in their spectacular views from rooftop hot tubs. It is always a big day for the little community when a new resident arrives — especially when they have a house in tow. More typically, newcomers simply move into vacated homes, but even so there tends to be major shuffling around the docks as old-timers move up to prime front-row moorings and newcomers shoehorn themselves into the back. Lange’s clients wanted the back row, as it happens. There’s less noise and wake action from passing boats, and with proper planning they found they could still enjoy plenty of scenery. The small, angled side windows and big front sliders are oriented precisely to the view corridors between and over the adjacent homes. It helps that Lange worked floor-space magic on the lower levels, massing the electrical and plumbing conduits on the south side in order to raise ceilings to the max on the north. His trickiest challenge was providing his clients with the top-floor family room they wanted while respecting the Sea Village bylaw that no more than a quarter of the house could reach the 26-foot height limit. The result is a bright little gem of a room perched atop the jewel-box house, opening out to a large play area — the best of all possible backyards, say the children who live here. Especially when the tide is in, and the whole village rises 16 feet. CREDIT: Glenn Baglo, Vancouver Sun files The federal government won’t discuss leaky condos because of a lawsuit by a group of owners. OTTAWA – The federal Liberal government was accused Wednesday of covering up its alleged complicity in the $1.5-billion leaky condo crisis in B.C. after the government released hundreds of whited-out pages of internal documents and correspondence on the issue. Conservative MP John Cummins, citing internal documents he obtained earlier this year, alleges the government was aware starting in 1980 that stringent federal home insulation requirements brought in to save energy prevented houses in wet climates — particularly in B.C. and Newfoundland — from “breathing” and drying out quickly after rainfall. But Industry Minister David Emerson, responding to Cummins’ formal request in May for follow-up answers about those documents, said earlier this week there will be no more answers because leaky condo owners are suing the federal government. “The government is attempting to hide [its failure to prevent the condo crisis] by claiming the issue is before the courts,” Cummins told the House of Commons Wednesday, rising to allege that his right as an MP to defend his constituents’ interests has been violated. Speaker Peter Milliken called the complaint “serious” and said he will make a ruling as soon as possible. The hundreds of pages of whited-out internal documents were released this month after Cummins (Delta-Richmond East) filed an Access to Information request demanding all internal memos and e-mails relating to his own May 17, 2005, formal request for answers from Emerson. Cummins has already filed a formal complaint with Information Commissioner John Reid, asking him to determine if the act was violated. The federal government has never acknowledged any liability on the matter, although it has provided nominal assistance to some homeowners. The internal documents released earlier this year were not available when former premier Dave Barrett did two major reports on the crisis between 1998-2000. Cummins said he believes federal officials were aware in the early 1980s that a problem with conservation programs and the National Building Code were emerging, but buried those concerns because the potential liability costs were too high. – An Aug. 4, 1981 internal memo produced by officials from Canada Mortgage and Housing Corp., the federal housing agency, pointed to problems emerging at the time in Newfoundland. “This condition demands early action by builders and homeowners, otherwise, early deterioration by rot of wood frame houses in Newfoundland, and most likely other parts of Canada, will reach major proportions,” the memo stated. The memo, signed by four officials, also cited a “public relations” concern. – An Aug. 27, 1981, letter from then-CMHC president R.V. Hession to John Johnson, at the time B.C.’s deputy minister of lands, parks, and housing, to make the B.C. government aware of its concerns. “There is an apparent close relation between energy conservation attempts and high levels of moisture accumulation,” Hession wrote. – A letter was written on Dec. 1, 1987, to the deputy of the federal government’s National Research Council, from J.C. Currie, then the director of the building standards branch at the B.C. government’s municipal affairs ministry. Complaining about the National Building Code and energy conservation requirements, he argued that the federal government pushed for air-tight insulation without fully considering the consequences. “At present, incongruous though it may seem, it may actually be causing health problems, and also be creating the potential for some early structural failures,” Currie wrote. The documents obtained by Cummins don’t include follow-up memos ultimately explaining what the federal government did in response to the warnings. His list of questions to Emerson pushes for those answers. There are dozens of lawsuits making their way through B.C. courts by homeowners who have faced huge repair costs and in some cases personal bankruptcy over the disaster. Vancouver lawyer John Singleton, whose law firm specializes in construction law, announced earlier this month that he believes there is enough evidence to successfully fight a class-action suit against CMHC. He said he is looking for an ideal plaintiff before launching the case. Thinking of diving into Vancouver‘s scorching condo market? Prospective homeowners get the green light; but quick buck investors get a cautionary yellow from a local expert. Bryan Woolley, president of Maverick Real Estate Corporation, told a condo-buying crowd at Fairmont Hotel Vancouver that good warranties, a strong economy and a wave of Asian immigration will boost market demand and prices in the long term. But interviewed after his speech, he said ‘flippers’ ought to take care. “The exceptional growth of last two to four years is unlikely to carry on forever,” Woolley said. And Woolley acknowledged a recent cautionary report on the Vancouver condo market by Pricewaterhouse Coopers advisor Neil Atchison has some validity. Atchison reported condo supply in areas like Richmond and Burnaby/New Westminster is in danger of exceeding demand. While addressing Atchison‘s concerns, Woolley said Vancouver condo demand should continue to exceed supply and even if the market softens, it will continue to climb long-term, because of Vancouver‘s limited land and projected population growth. “It’s hard to time the market perfectly. I have friends who have been waiting for 20 years, but you make money by owning, not renting,” Woolley said. Both Woolley and Real Estate Board of Greater Vancouver president George Pahud said the perception condos are a better investment than houses currently isn’t true. “Both markets have sales to listings ratios over 90 per cent,” said Pahud, adding there is no indication the condo market is running out of steam. When he first visited the presentation centre, Raffles prospect Howard Don reports, he had to really look to find the fridge. 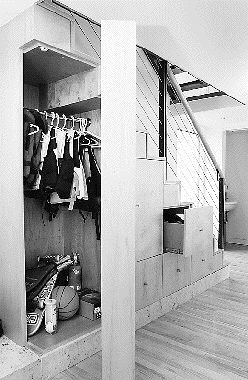 It’s behind the ‘pantry’ door in the photograph (left), a compact affair from a Swiss manufacturer, Liebherr. Miele will supply the cooktop, wall oven and dishwasher and Panasonic, the microwave. In the bathrooms (left and right) the developer selected Caroma for the toilet and basin and La Torre for the bath and show fittings. 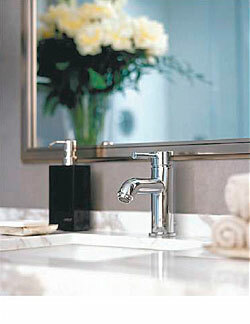 Marble will top counters in most of the Raffles bathrooms; polished granite, the kitchen counters. The floorplans for 32 of the Raffles tower-homes are reproduced here. The smallest Raffles apartment (above) offers about 565 square feet of one-bedroom-with-den residency; the largest (right), about 865 square feet of two-bedroom residency, with den and flex room. Their runtof-the-litter status has not denied the smallest homes topdog prominence. They are repeated on 16 south-facing floors, the biggest homes right next door. 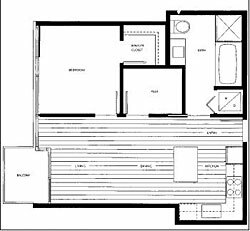 Residence size: One bedroom; one bedroom + den; two bedrooms; two bedrooms + den, 565 sq. ft. – 945 sq. ft.
On one of the walls of the Raffles presentation centre hangs a rusted steel charger from Martha Sturdy, figurative profession of the possibility that to live in this downtown tower is to arrive — in a living space infused with Zen-like tranquillity. Larry Beasley an ultimatum, to downtown-tower developers, Go East. After 10 years of adding 1,500 to 2,500 homes annually to the downtown peninsula, they advised in separate addresses to the development fraternity, you are running out of land in the peninsula’s western and central parts and, further, city hall was planning new restrictions on the use of the remaining sites in those parts. If developers wanted another 10 years like the previous 10, they must go east, to Chinatown and Gastown, the Downtown Eastside, the False Creek flats and southeast False Creek. 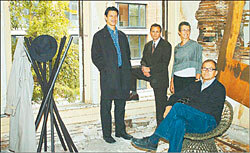 At the Raffles new-home project at the intersection of Robson and Cambie streets, Bob Rennie has, indeed, gone east. His walk your talk starts at the two-Starbuck intersection of Robson and Thurlow. A block north is the Living Shangri-La new-home project. It and Raffles are Rennie Marketing Systems jobs. In between Living Shangri-La and Raffles are two more RMS jobs, L’Hermitage and R&R, both at the intersection of Robson and Richards. “Robson is becoming a much longer street,” Rennie says, a “more animated walk.” Raffles and Living Shangri-La are nine blocks apart, eight short blocks and one long block, the Vancouver Art Gallery block. By the electronic map on city hall’s web site the two new-home projects are a little more than half-a-mile apart. The arrival of a Chapters bookstore, with a Starbuck’s, at Robson and Howe was the inaugural retail pull; the arrival of a Winnners apparel and home-accessory store at Robson and Granville, the second. Anybody who knows the upper floors of the main library knows the prospects to the south and east are equal to the prospects to the north and west, if different, more, or all, built environment, less, or some, natural. Those prospects very much influenced the design of the Raffles building and presentation centre. The building design protects the views of neighbours. The presentation centre projects the view possibilities. 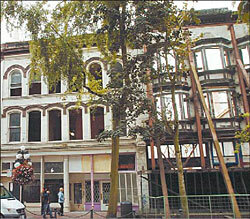 The building has three components visible from the street, two of them steps back, or south from Robson, to the tower component. “The building setbacks protect the views of the neighbours to the west, to make sure they had view protection,” Rennie says. 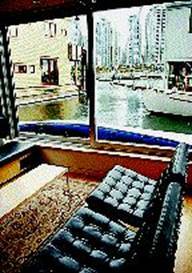 The presentation centre’s most important vignette is a picture-window view across False Creek, a representation of the views from upper-storey homes on the south and east sides of Raffles. No you probably can’t place a big sectional and a dining table with sidechairs in a Raffles apartment, Rennie says. ”Yes, if you’re going to rely on the big bar service, the four bar stools, if you will eat there and enjoy yourself there, you can have as big a sectional as your want. What will be there will be artfully designed to appear bigger than it is. “[The] spacious design of every home maximizes usuable living space,” the sales literature promises. The most visible manifestation of this pledge in the presentation centre is the refrigerator, manufactured by a Swiss company. It was selected because, at 27 inches in depth, it’s no deeper than the kitchen counters and it will be faced with a cabinetry finish. Like most anything that meets special needs, it also comes with special price, $4,700, almost as much as a big Sub-Zero, Bob Rennie reports. “In these open-floor plans, appliances have to become furniture,” he comments. A prospective Raffles buyer, Howard Don, recalls that when he first visited the presentation centre he decided that it must not be finished because at first he couldn’t see a refrigerator anywhere. He is not much of a cook, he reports: “My financee is a very good cook. My form of cooking is pulling out the credit card for take-out.” The two will marry next September. Howard is a 33-year-old Vancouver native, educated at the B.C. Institute of Technology and the Southern Alberta Institute of Technology. He is also a basement-suite graduate. A Yaletown apartment-owner already, he reports growing up in a ”Vancouver Special” helped him prepare for small-space living as an adult. 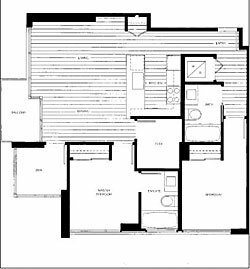 ”The basement suite where I hung out the most and where my bedroom, and my brother’s bedroom, were is quite similar to a condo. Two things he knows from apartment residency in Yaletown: A black colour scheme “makes life eaiser” and views there are hard to come by. If he buys at Raffles, and he expects to, he will select the “Black Mahogany” scheme and not the “White Oak” scheme. “I do not know if I am going to live in it or I will rent it out or one of my siblings is going to live there. He thinks one of the building’s amenities – the bicycle-storage facility – an important component of the project, but is less sure about another – the concierge. “A bicycle storage is very imporant to me. At present I do not own a bicycle, but would like to know there is a place to keep one, with the limited living space and barbecue space on the deck. That a young Vancouver man might not have any ”expectations” of personal service from a concierge, but every expectation a concierge will make the building a safer place does not surprise Bob Rennie. Raffles, by the way, does not end Bob Rennie’s eastern foray. He’s preparing now to market East in Chinatown and Woodwards, both east and north of Robson and Cambie. And he has bought the oldest building in Chinatown, next door to the East new-home project, and plans to convert it into Rennie Marketing Systems’ corporate offices and a private art gallery. Either in between or at the same time, however, he will do some backtracking to Hastings and Howe for Jameson House, which is he now advertising, and to Coal Harbour. The Raffles homes are a reasonable living-space response by developer and marketer to the recent history of high-rise-apartment demand. 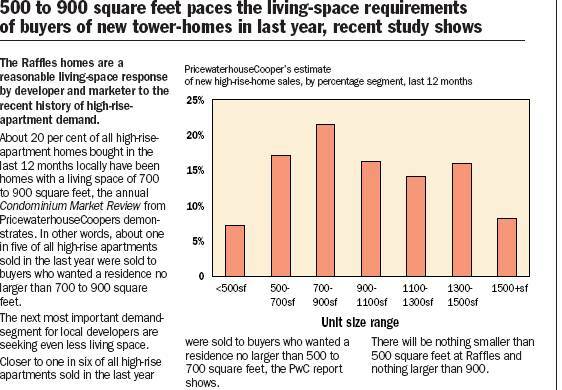 About 20 per cent of all high-rise-apartment homes bought in the last 12 months locally have been homes with a living space of 700 to 900 square feet, the annual Condominium Market Review from PricewaterhouseCoopers demonstrates. In other words, about one in five of all high-rise apartments sold in the last year were sold to buyers who wanted a residence no larger than 700 to 900 square feet. The next most important demand-segment for local developers are seeking even less living space. Closer to one in six of all high-rise apartments sold in the last year were sold to buyers who wanted a residence no larger than 500 to 700 square feet, the PwC report shows. There will be nothing smaller than 500 square feet at Raffles and nothing larger than 900. A huge view calls for a quiet living situation. Our home is our refuge, our quiet calm space. There are three main issues:  The busyness and colourfulness of the patterns of the view;  the colours that go with so much light;  the sensitivity of art in that kind of situation. One cannot have too much form, height, colour or pattern mixed in with the furniture. It would conflict with the view. And this comes from my personal perspective as we have a glass house, with a view, and we have eliminated most of the colours and patterns over the last 10 years. They just didn’t work. I would suggest a light, low, blocky sofa with matte non-reflective horizontal table surfaces. About the other view issue, the light, I recommend greys, whites, colours that allow the colour of the light to vary them. And a mute, not boring beige, a mute clear palette. The light in Vancouver is grey with yellow and green in it, so the colours should harmonize and reflect those colours. Art is an issue because so much paper-based art is light sensitive. One either has to have paintings that can withstand the onslaught or really good blinds to protect the investment. As opposed to the furniture, I feel that the art must be bold and hold its own with the view. 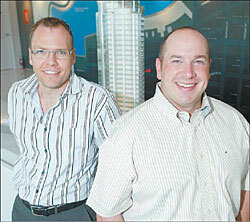 VANCOUVER SUN/FILES The MAC Real Estate Solution partners, Cameron McNeill (left) and Jason Craik, have generated $350 million in sales for developers so far this year. The Flatiron in Coal Harbour, for which this photograph was taken, was the latest MAC assignment to be profiled this year in Westcoast Homes; Brix in East Vancouver (top). the first. Homes in more than 300 condominium developments are currently for sale in the Lower Mainland and cranes are (seemingly) pulling more out of the ground daily. It can be a confusing marketplace for even the most diligent purchaser. But there are many things a purchaser can do to ensure the choice made is the best choice. Choose your area wisely and try to take the emotion out of the purchase. The location may seem perfect. But commuting costs could be high, bridge traffic a hindrance, personal safety may be an issue, or shopping and schools not up to what you want. Buy close to where you work. Or make your condo purchase with public transportation in mind. Transportation costs are a huge issue these days. A condo purchase on a major transportation route like the SkyTrain or West Coast Express could mean shedding the cost of a second car. Or no car may be necessary. The savings in vehicle cost, maintenance, insurance and gas will go a long way to making a mortgage payment. It may mean a much better condo purchase is possible. Get out and see the area. Walk around. Talk to people who live there. Check public transportation by taking a test ride. Drive through the community. Many developments aren’t advertised. The only way to see the widest selection of condo developments in the community you may choose to live in is to go there and have a thorough look. Take notes. Be a good researcher. Compare features like suite positioning, height and views. Does the suite have a balcony? Are there building amenities that you will use? Is the quality of construction giving you the best value? Purchasing before or during construction makes it difficult to visualize room sizes. Marketing drawings often do not show room dimensions and when your new home is complete you may find it hard to fit in that precious antique wardrobe. Get room dimensions from the salesperson and make a furniture layout. You should decide if you need all the amenities that a particular development is offering? Many people won’t use a pool, spa, exercise room or party room. You may not need parking for one or more cars. Factor that in. Don’t buy what you won’t use. This can save thousands. How many bedrooms do you need? Can you get by with less? You may be able to get a much better location by purchasing a smaller suite. Arrange to put excess belongings in storage. Research the developer before looking at the product. Choose your developer before you choose the condo project in which you will invest or live. Quality can vary just as developers’ reputations vary. Ask for references for people who have bought suites from a developer and check those references. You may be very surprised by what you learn about quality, after sale service and follow through with promised amenities. Check out the warranty. 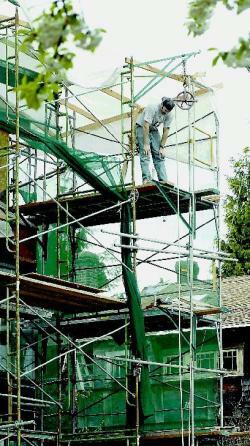 New rain screen technology should eliminate most concerns about leaky condos. Frame construction is cheaper than concrete. But wood can rot when it gets wet. Contact the Home Owners Protection office for information and advice along with the new home warranty company. Check the builders’ reputation with the Better Business Bureau. If there are complaints, they will show up there. Before you go home shopping, get a pre-approval for a mortgage. Determine how much you can afford to pay for a condo and how much money is available for a down payment. Do the math. Programs enabling 100-per-cent financing for some purchasers are available. Make sure you understand the monthly maintenance fees and what they buy. Upkeep of amenities has a cost attached to them and that is reflected in the monthly fees. If you don’t need all the amenities, don’t seek them out. You will save money if you are not making monthly payments to maintain amenities you will never use. Finally, shop and compare. Take your list of features for suites in each development. 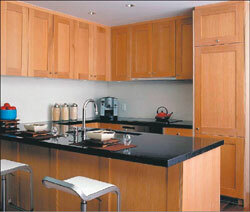 Features such as granite counters are expensive. But they add great value to suites and may be a factor in return on investment. Compare amenities such as pools and fitness centres. Location can determine the cost of a suite. This can also affect the return on your investment when you sell. Construction features like soundproofing can be a big factor in enjoyment of your condo purchase. Since many new condos are sold up to two years before completion of construction, asking questions and gaining full satisfaction before you sign on the dotted line is essential. There has never been a better time to buy a condominium be it in a low rise building, a tower or a town house. Doing your homework before the final choice just makes sense. Gastown is undergoing another birthing experience, ”risk oblivious” new-home buyers, daring property developers and Vancouver city hall among the midwives. Gastown, as city hall documents say, is the “birthplace of Vancouver.” The colonial government in Victoria conducted the first land sale there in 1870. The first conversion of the Victorian and Edwardian buildings there occurred a century later. The current revitalization, accordingly, is the third birthing moment there in about 135 years. The renovation about five years ago of the Old Spaghetti Factory building, itself a refurbishment in the first rebirth, heralded the current round. But the pursuit of a “Soho-like” neighbourhood hasn’t been easy. The city’s poorest neighbourhood — the downtown eastside — is next door, a proximity that has scared off potential investors for years. Gastown is a confined space. The passage of a cement truck, for example, is more time consuming and more costly here than elsewhere. Many of the old buildings have suffered substantial deterioration after years of neglect. Still long-time property owners such as Reliance Holdings Ltd. and Nancy and Niels Bendtsen of Inform Interiors and newer investors like the Salient Group are commited to making the effort. City hall is also committed to helping them make the effort, with a heritage-preservation which includes property-tax relief. The incentives are also being offered to Chinatown and Hastings Street, with the hope that all three communities will reap economic benefits. “I have faith all three areas will improve,” councillor Jim Green says. The mayoral candidate attributes the renewed interest in the three areas to the Woodward’s revitalization and a new bylaw. As anybody who has read a newspaper or watched the news recently know, he is the city’s leading champion of the latest Woodward’s plan, 700 new homes in a 40-storey tower, 500 of them market housing, 200 of them social housing. “Woodwards is seen as the rebirth of that area of the city, and the animosity that used to exist between Gastown, Chinatown and Hastings in rapidly declining,” says Green. He adds another reason for the improved relationship is downtown eastside residents no longer fear being displaced, as so many were before Expo 86. The main reason for that, says Green, is a bylaw he first proposed to protect SROs (single-resident-occupancy rooms) in 1984 was finally passed 20 years later. “People in the area can now welcome new development without fear of being displaced,” he says. Green adds Gastown specifically has enjoyed a resurgence in tourism thanks to Storyeum — an interactive museum about B.C’s history. It was created in a former parkade. “Gastown is fabulous. It’s like the sleeper area of town,” Nancy Bendtsen of Inform Interiors says. Niels Bendtsen bought a historic building, at 134 Abbott, 40 years ago and renovated it to showcase his store and provide office space upstairs. The couple also owns a building across the street, at 50 Water Street, and plan to expand their furniture showroom. Another heritage building to be among the first to undergo extensive renovations was the landmark Old Spaghetti Factory, at 55 Water Street, in 2000, by Reliance Holdings Ltd. The company also built the modern glass atrium adjacent to the Old Spaghetti Factory, a former parking lot, that rents to the high-end clothing store Richard Kidd. Reliance also has a new 10-storey building with 58 rental suites and two large retail spaces at 33 Water and another building with 130 units which could either be rental or live/work. Stovell adds when Reliance began marketing the rental units at 55 Water Street “no one came in and said ‘is this neighbourhood safe? Where can you buy groceries? Why are people panhandling or will I get ripped off?’ They don’t ask those kinds of question. “People who come down here already know about the downtown eastside (nearby). They know what they are getting into,” says Stovell. 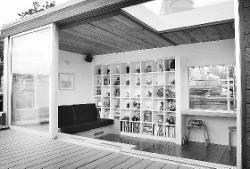 He adds the area is attractive to many creative business operators like gallery owners and funky restaurants and shops. The residents, he says, are in their 20s and 30s, and work in occupations like software technology, graphic designs, film and architecture. And while years ago there was a push by merchants in Gastown to rid the area of panhandlers, says Stovell, that fight appears to have ended. “We used to have an ultra polarized turf war but people have buried the hatchet and both groups go about their business,” he says. “Now we have the well-off, who are not that ostentatious, with busy active careers who like living in the core, going out for dinner, immersing themselves in urban living, living in the heart of the inner city mixed in with the grit. While, Gastown has historically been an area for tourists to shop for B.C. souvenirs many of the retailers today are aiming to attract an upper end local market as well. “There’s been a concentrated effort among a core group of property owners to improve the buildings and to target a certain kind of retail,” says Stovell. Wanting to tap into the upper-end market are newer developers like Salient’s Robert Fung, who at only 39 years of age is hoping to do on a smaller scale what Concord Pacific did years earlier for Yaletown. Indeed, Fung, whose first project was in 2003 with the renovation of the Taylor Building in Gastown, worked for Concord for eight years. The Taylor building, opposite the famed gas clock, was converted into 22 suites and quickly sold out for an average of $320 a square foot at the town – rates that typically were seen in more desirable downtown locations. Still, Fung says many of the larger developers in the city think he’s crazy to be developing in an area they still view as high-risk. Still, Fung and his wife prefer to live in Kerrisdale themselves because they are the parents of three young children, ages three, two and a newborn. “One of the problems (in Gastown) is the cost is so high it’s difficult to build good quality family housing in the core,” says Fung. His target market group for his “boutique-size projects” are buyers who themselves are very unique and want a unique home. Fung’s current residential project is the conversion of the side-by-side Grand and Terminus hotels. The goal is 46 new homes. Prices are not yet set. “With the Terminus Building we’ve really tried to do a building with a great sense of style, highly identifiable and in some ways iconic for the area. A building that is a pleasure to live in,” says Fung of the project, at 36 Water Street. The Terminus Buildings will also have a small retail componet, of about 5,000 square feet. Another Salient project is the renovation of Gaolers Mews, where 40 per cent will be utilized as live/work spaces and the remaining 60 per cent will be retail/office space. This landmark building once housed the city’s oldest parking garage and a courthouse and jail. The stones for the Alhambra Building, where the Salient offices ar located, in the mews was laid in 1886. For many years, the ability of young people to afford to buy their first home in the Lower Mainland has been a concern in the building industries. The findings from the Greater Vancouver Home Builders’ Association’s annual survey of first-time home-buyers suggests our concerns won’t go away any time soon. Young families across Canada are having a more difficult time than previous-generation young families making ends meet, a study by the Vanier Institute of the Family reported last year. The largest declines in net worth are in the under-25 and 25-34 age groups — prime first-time home buyers. The declining net worth in these groups is a reflection of lower homeownership rates (ie. fewer families with home equity); and a diminished ability, due to sluggish employment earnings, to provide a down payment for a home. Factor in ever-increasing fees, levies, charges and taxes imposed by all levels of government, and it adds up to a difficult time for our young people. Thank goodness for low interest rates. More than 800 people attended our 12th annual seminar last spring, generating 326 completed survey-forms. (Many couples answered the survey questions on one form only.) Canada Mortgage and Housing Corp. tabulated the results at its research centre in Ottawa. – 25 to 34 years old. – Currently renting outside the natal home. – Planning to purchase a home with a spouse or partner within one year. – 72 per cent of respondents indicated they simply could not find the home they wanted at a price they could afford. Thirty-nine per cent said they did not have enough money for a down payment. Hate to start off on a gloomy note, but these concerns placed one-two last year, and the year before that, and, well, you get the picture. What’s particularly worrisome is the affordability issue is up eight per cent from last year and the down-payment concern is up 10 per cent. Sounds like an echo from the Vanier Institute for the Family study chronicled a few paragraphs earlier. – 66 per cent of respondents currently rent accommodation, while 22 per cent live with their parents. Both are consistent with last year’s responses. Today’s low mortgage rates trump rent cheques. Perhaps mom and dad can help with the down payment. Hey, get the kid out of the house and convert the bedroom into a den. Just remember the boomerang factor — what moves out, might come back. – 64 per cent will be purchasing their first home with a spouse or partner. Twenty-nine per cent will be home alone. Five per cent indicated they would be buying with a family member. Again, consistent with last year’s responses. People are pooling resources and sharing the expenses and experiences of homeownership. Friends rent together, so why not buy together? – 32 per cent said they will buy within six months, while 39 per cent indicated they will take the plunge within one year. Eighteen per cent said two to three years, up eight per cent from last year. The sense of urgency was slightly less of a concern for respondents this year, despite rising real estate prices. They want to climb on the equity ladder soon. However, they seemed confident interest rates will remain low for some time and they are taking a little of that time to be sure. – 34 per cent said they plan to buy a detached home; 26 per cent, a townhome; 19 per cent, a lowrise condominium; and 16 per cent, a highrise condo. The rest were undecided. Goodness, this was a strange one. Last year, only 14 per cent indicated a detached home. High prices are a concern with respondents, so I don’t know if this is a case of wishful thinking or they intend to buy a home in the outlying areas. I will check into this response to make sure the stats are correct. – Six per cent said the maximum price they would pay for their first home is less than $150,000; 13 per cent said $150,000-$199,000; 19 per cent, $200,000-$249,000; 21 per cent, $250,000-$299,000; 21 per cent, $300,000-$349,000; and 18 per cent, more than $350,000. This is one for the record books. Sixty per cent of respondents expect to pay $250,000 or more for their first home. Last year only 33 per cent said their maximum price would be more than $250,000. This reflects a realization that high real estate prices are here to stay in Lotusland-by-the-Sea. According to CMHC research, 93 per cent of all new single-family homes in the Lower Mainland are priced at $350,000 and higher — tops in the country. That statistic provides little comfort to first-time buyers. – 25 per cent of respondents indicated their down payments will be five per cent or less, and 28 per cent said 10 per cent, nine per cent said they have 15 per cent down, 12 per cent said 20 per cent down, and 22 per cent of the respondents plan on having a down payment of more than 25 per cent. Again, not many young people have healthy cash reserves to use as down payments, with less than one-quarter of the respondents above the 25 per cent threshold. – 52 per cent of respondents said they will use RRSPs as part of their down payment, with 39 per cent of that group intending to use $20,000. This shows a high level of financial responsibility. The withdrawal of $20,000 in RRSPs per person can be repaid as a lump sum (wishful thinking) or instalments over 15 years. – 27 per cent of respondents indicated they could make do with a home sized under 1,000 sq. ft., while 34 per cent preferred 1,000-1,500 sq. ft. 20 per cent said 1,500-2,000 sq. ft. and 15 per cent wanted a home with more than 2,000 sq. ft. of living space. Reasonable expectations from the majority of first-time home buyers. Today’s new homes are well designed and in many cases feel much larger than they are. Kudos to the architects and designers. – 13 per cent indicated they only wanted one bedroom, 47 per cent said two bedrooms, 31 per cent said three bedrooms, and seven per cent said four bedrooms. Again, reasonable expectations that basically mirror last year’s responses, although the group preferring two bedrooms was seven per cent higher than last year’s 40 per cent. Also, it appears one of the bedrooms will be used as an office or computer location. – 73 per cent of respondents use the Internet to obtain information on how to buy a new home. (More than one answer was chosen by some respondents.) The print media was second at 40 per cent and a realtor was third at 34 per cent. This comes as no surprise. We are, after all, talking to a largely techno-savvy group which intends to use the internet extensively, including obtaining information on new housing developments and mortgage-banking options. – Information deemed to be most helpful to the respondents included mortgage financing (73 per cent), how to inspect a home (68 per cent), housing market details (67 per cent), home warranty (47 per cent), builders (44 per cent), and new housing developments (38 per cent). It is incumbent on everyone involved in the industry to help satisfy this thirst for knowledge by educating and informing. Buying a first home can be intimidating and confusing. Providing reliable information to potential home buyers is key to demystifying the experience. – Regarding location preference, respondents were literally all over the map. The good news is that builders and realtors across this region offer a broad range of housing types, both new and resale. – 67 per cent of respondents indicated they chose a realtor through referrals from family or friends. Nine per cent said Internet research, six per cent said they chose a realtor they had contacted previously, five per cent said they were attracted to a realtor’s advertising presence and three per cent said they wanted to deal with a well-known real estate company. – A whopping 98 per cent of respondents said it is important that their new home is protected by home warranty insurance. Last year this number was 93 per cent. I have a difficult time understanding why the number is not 100 per cent. A home is arguably the largest purchase these folks will make. It is crucial their significant investment is fully protected. – Features most desirable to respondents include, in order of importance, energy efficiency, healthy indoor air quality, secondary suites, flexibility-adaptability, home office and finished basement. Today’s first-time home buyers belong to the Blue Box Generation. They were weaned on conservation measures, and they want healthy home design and construction. Also, secondary suites have come out of the closet. Municipalities should come to grips with this issue. Here’s a sign of the times: One respondent said he would like acreage — a minimum 5,000 sq. ft. lot. I was torn between laughing and crying. – 78 per cent of respondents said they would be very likely or somewhat likely to purchase an energy-efficient home knowing that they could be eligible for a 10-per-cent refund on a mortgage loan insurance premium from CMHC. – 10 per cent of respondents were aged 18-24, 49 per cent were 25-34, 21 per cent were 35-44, 14 per cent were 45-54, and three per cent were 55 and older. As was the case last year, half the respondents were in that marketing dream category — 25-34. – Finally, 95 per cent of respondents said the Greater Vancouver Home Builders’ Association is a credible organization, and 96 per cent gave the seminar an excellent or very good rating. That’s a ringing endorsement by any standards. In a month or so I intend to contact some couples who attended our seminar five years ago. It will be interesting to learn how their lives have evolved since 2000. Two award-winning custom builders (and drivers of big pickup trucks), Gary Friend and Harald Koehn, both expressed frustration, to me, with always being lumped in with the bad boys. They have a point. Many builders who build two or three homes a year do, indeed, drive pickup trucks. They have to if they want to function properly. These hard-working folks, some in business for more than 25 years, stand proudly behind every home they build and are every bit as professional and knowledgeable as the experienced, large-volume builders. And, by the way, there were a few large-volume builders who breezed into town years ago, built some multi-unit condominium buildings then disappeared, never to be seen again. I am sure that Homeowner Protection Office CEO Ken Cameron will join me in confirming that new homes built today are covered by one of the strongest warranty programs in the world. Meanwhile, we at the home builders’ association support the actions of the Homeowner Protection Office, particularly its efforts to ensure new-home buyers are well served by the homebuilding and home-warranty industries in B.C. Peter Simpson is chief executive officer of the Greater Vancouver Home Builders’ Association. You are currently browsing the Les Twarog Vancouver Real Estate and Condo Blog blog archives for September, 2005.